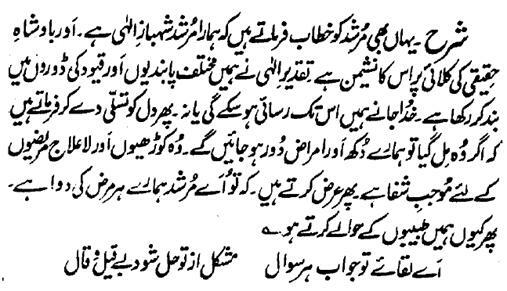 Here also, he Rahmatu-Allahe Ta-aala Alaihe addresses to the honor of his Murshid that 'Our Murshid is the Goshawk of Lord and its station is on the wrist of the Rightful King. Predestination of Lord has tied us in different limitations and regulations. God knows if we will be able to get him or not. Then, consoling his heart, he says that 'if he is found, our grieves and ailments will end. He is the means of cure for the lepers and incurable diseases. Then he says that 'O Murshid! You are the cure of our every disease. Then why do you hand us over to doctors! Problems get solved without asking and telling by virtue of your Auspiciousness (and blessing).